Devon Blake was London’s most wicked lover but when he sleeps with the wrong woman and leaves her unsatisfied, he finds himself cursed by none other than the Goddess of love herself. After living two centuries trapped as a marble statue, Aphrodite gives Devon one chance to redeem himself or he’ll face an eternity of made of stone. He must prove he can satisfy a woman’s every desire without satisfying his own. When Rebecca discovers a naked man in her art gallery instead of a priceless statue at midnight she has no idea he’s the answer to her prayers. Aphrodite has sent Devon to be Rebecca’s perfect man. Can Devon earn Rebecca’s love and trust by proving his selflessness or will it be too late? Museum curator Rebecca Clark has had nothing but bad luck when it comes to men; the prettier they are, the worse they are; she would want nothing more than finding the elusive Mr. Right. One evening, admiring the museum’s most recent acquisition, a gorgeous statue of a most handsome man, Rebecca’s wishes come true, or do they? 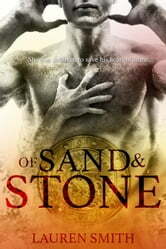 Time-travel romances do not usually pique my interest, however OF SAND AND STONE sounded different, and is it ever! Lauren Smith has written a terrifically entertaining story, with great characters, but what’s most remarkable is that OF SAND AND STONE is exceptionally funny! Ms. Smith uses her historical knowledge to show how Devon Blake, a Regency rake, is lost in the twenty-first century, and I’ve never seen it done better. I loved how we saw modern contraptions through Devon’s mystified eyes, and I really laughed out loud several times; it was very cleverly done. Some of the highlights were Devon trying to understand American idioms and lingo; the dialogues were impeccable: Devon sounded every bit the nineteenth century aristocrat, while Rebecca was totally today; simply delectable! The story might be short, but it’s perfectly structured, there are no loose threads, and it’s entertaining from beginning to end, and Devon, the selfish rogue, wonderfully redeemed himself; he was delicious! Whether you enjoy contemporary romance or historical, even if you think time-travel romances are not your cup of tea, give OF SAND AND STONE a try because it is a marvellous way to pass a few hours! The book also includes an excerpt of GRIGORI, another one of Lauren Smith’s books, and some goodies. I voluntarily reviewed an advanced reader copy of this book.